Previous post: A post is not a podcast. In this episode: How to lose an episode without losing your mind; how to get over the hype; what happened with Damson; falling down, and getting back up again. These are the weighty topics considered today, briefly. Again, I talked at length about Damson. Soon there will be pictures of me wearing it in many ways. Music by Amy Steinberg, “Exactly” from the cd Must Be the Moon. Good Morning Brenda! Happy to hear your voice this morning and it did not sound all that “croaky”. Hope you’re feeling better. 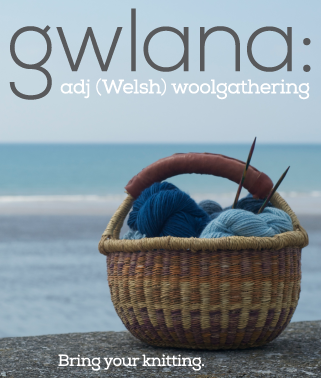 Your podcasts are nearly perfect, intro music, one song and you talking about your knitting. My selfish request is that they be a bit longer but now that they’re coming more regularly, I may be able to settle in and be satisfied knowing there’s more coming soon!! Love your audible recommendations. If you have not yet listened to The Guernsey Literary and Potato Peel Pie Society, I believe it is one you will truly enjoy as it’s so well done. I listen to many, many audible books and this remains one of my absolute favorites. Be well. Totally agree with you about the GLandPPPS! The audio version is excellent. Apparently Kenneth Branagh is about to make a movie of it- let’s hope it’s a good one! Anyway, loved the podcast, loved the story, love the Damson photo. Thank you. Feel better. A little drop of something flammable in that ginger tea might help. If you’ve got the makings handy, a bit of whiskey in a nice hot cup of lapsang tea is good for what ails you. Hi Brenda. I can’t tell you how much I love your podcasts. I listen to them as I walk in the mornings. I pretend that we are best friends and it’s an audio letter to me from you. May I ask a question about the music. I know you used to use music that is podcast cleared. Is that still the case? “Exactly” is EXACTLY the message I’d like to end my own next podcast with, but I’m unclear whether it’s okay to use it. I don’t charge for my podcasts, so there’s nothing commercial about its reuse. Anyway, love Cast On, love the shorter length, the content, the one song at the end, and the new sense of honesty and authenticity I hear in your voice now! Hello Brenda! I’m listening to this week’s podcast and knitting my P3 sweater as I listen to you discuss the challenges of ripping back your Damson. And as you talked, I found a place in the lace where I had to do just that. I let stitches fall, and wielded my crochet hook, and felt masterly and clever even as you talked about it. I hope you’re feeling better by now, little bunny! Poor little bunny. Get well soon, Brenda. I was cleaning off the dining room table/desk when you said that you’d ripped it that Damson out three times and I literally stopped and said, “No!” it was as if you were in the room telling me the story. Feel better. Poor bunny, hope the throat is feeling better and you are getting lots of loving care. I recently finished knitting and blocking the pieces to a sweater, perfectly to the pattern measurements I might add, and was loving how it turned out. I stitched the shoulder seams and flopped it over my shoulders and my heart sank; the sweater looked way too short. I basted the side seams, nope-still too short. 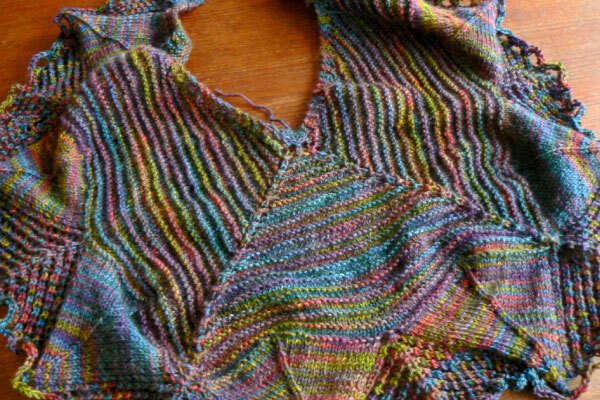 After ruminating on it for days, lots of math with the calculator and measuring how many yards of yarn I had left I decided to bravely cut it and knit down. It worked like a charm, I love my new sweater and I feel fearless about my knitting now. Glad you were able to finish your Damson so you are happy with it; I know the feeling! Poor Little Bunny! Thanks again for the great show, I adored the song you had, made me teary, will be going onto iTunes to buy that one! Also, I listened to ‘The Help’ via Audible and loved it to bits. I haven’t actually seen the movie and kind of don’t feel I need to, the audio book was that good! And thanks to the book recommendation by Joanna on the comments here, I have a credit waiting in my Audible account and I reckon I’ll be buying The Guernsey Literary and Potato Peel Pie Society next! Looking forward to hearing about how not to look like I’m wearing a doily on my shoulders too.. I wanted to say thank you for producing Cast On for all these years – I discovered the podcast this time last year, and already it has accompanied me on many a journey. I listened to all the back episodes as I cycled to work and back in 2011, and it certainly made the morning hills much more bearable! November saw me go travelling for the first time – I write to you from Japan, having travelled here overland from the UK. Cast On was wonderful when I was feeling lonely on a train speeding through Siberia, and is cheering me up once again as I heal a badly bashed and bruised leg (and miss some of the best snow yet…grumble grumble!). All of your hard work is very much appreciated – I like the new format,and am glad you kept the theme tune! From one poorly knitter to another; feel better soon, and thank you, so much. Awwwww, poor bunny, get well soon Brenda! Drink much tea, do much knitting and feel much better. Knitting…What doesn’t kill you does make you stronger. This week you are the Fingerling Weight Champion of the knitting world! Thanks for another great podcast. Hope the throat is feeling better. Have you heard anything about the Dave and Gary dolls? I was hoping they would find their way back to you with the journal. I just discovered your podcast in November (thank you, Amy Singer! ), and I’ve become a devoted knit sib. Thank you so much for your dedication, your lovely commentary on life, and your practical attitude. I listened to you on Sunday while hemming a pair of slacks for my hubby, because that’s one of the things we do for those we love. Poor Little Bunny feel better real soon. You are prolly all better now and my wishes are too late….but “I am exactly where I need to be, exactly where I need to be”: a long time listener first time poster. Thank you for encouraging me and my pointy sticks to keep going. Love the show, Bunny. Feel better – although by now either you are better or in the hospital!!! I know what you mean about the taking risk thing in knitting. I am knitting a cable sweater and made a huge mistake. I sucked it up and did a drop down in a cable seed stitch section, it worked, it worked !!!!! I am happy. You are such an inspiration. Poor bunny Brenda. I do hope you are feeling better. But in all seriousness thank you so much for this weeks episode. It made me laugh out loud and then the music made me cry with happiness as it just suited me at that time perfectly. I was listening driving home from doing something great that will leave my future in the hands of fate. Thank you so much for a fantastic podcast. I am so glad we are getting small bits from you frequently. Hey Brenda! 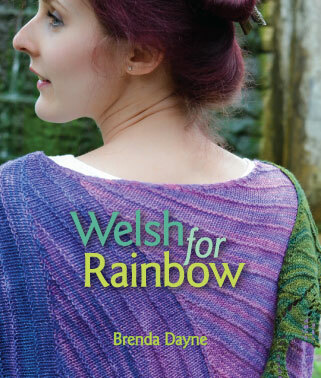 I hope you don’t mind me telling everyone who loves you about the Brenda Dayne fan group on Ravelry. Right now we have started an Amroth Beach Knit-a-long. All are welcome to join in. We are just getting underway for February. Love the podcast and especially LOVED the song “Exactly”! Thanks for introducing me to it. Get well soon Brenda! These last few months I have listened to every single Cast-On podcast right from the beginning and it’s been wonderful! You’re my knitting inspiration! Thank you for producing such a fantastic listening experience, and by the way, the song at the end was awesome. I’ll be buying that one for sure! I’m obviously a bit behind on the podcast. I hope you are feeling better by now. Just listened to this episode for the second time today, because I loved it so much the first time. Your Damson Shawl is gorgeous. Thanks for the hints about falling down & getting back up again. I also loved the song at the end, sounded like Ani DiFranco, but it’s not one I have heard before. It was so perfect for the time I heard it, driving to work one day, feeling defeated and like I am really not good enough in so many ways. Another wonderful podcast, and I listened to it while knitting on my Tintern Abbey socks. Yes, they’re coming along very well, thanks for asking. The song was what prompted me to comment. It was such a perfect pick for the subject matter and perfectly summed up my own view of life and the curves it throws me. I’m late in listening, sure your sore throat is long since better, but you have my sympathy anyway.